Pi Wars 2017 is just a few days away! 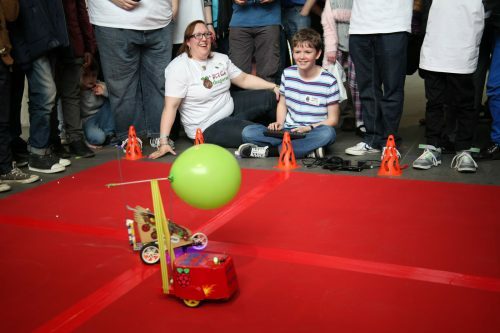 On 1-2 April, Cambridge Raspberry Jam will be hosting Pi Wars 2017, the latest iteration of their successful robotics challenge competition. For those unfamiliar with the setup, Pi Wars contestants use home-brew Raspberry Pi-powered robots to compete across seven challenge courses. There’s also a host of other categories, including prizes for Artistic and Technical Merit, as well as an award for ‘Funniest Robot’! With only a few days to go until the big weekend, we’ve wrangled Pi Wars 2017 hosts, Mike and Tim, to give us the lowdown on everything you need to know before the main event. Sunday – Beginner, Intermediate and Pro/Veteran teams. With teams coming all the way from the USA, Germany, Switzerland, Wales and Scotland as well as England, it truly is an international competition! There are more than 65 teams competing across the weekend. Judging by some of the tweets we’ve been seeing, there’s likely to be some fierce competition! 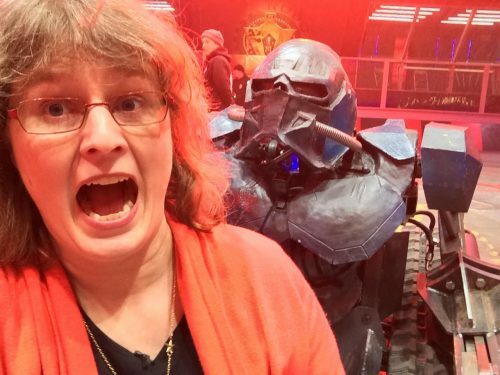 We are very fortunate to welcome BBC Robot Wars judge Dr. Lucy Rogers as our special guest and head judge. Away from Robot Wars, Lucy is an independent designer and maker, and famously introduced Raspberry Pi-controlled animatronics to the Blackgang Chine theme park on the Isle of Wight. If you’re in the Cambridge area, or even if you’re further afield, you can come along and watch. Pi Wars 2017 spectator tickets are available from Eventbrite. Children aged 16 and under go free, as do volunteers, and it’s just £5 per day (or £7 for the whole weekend) for everyone else. 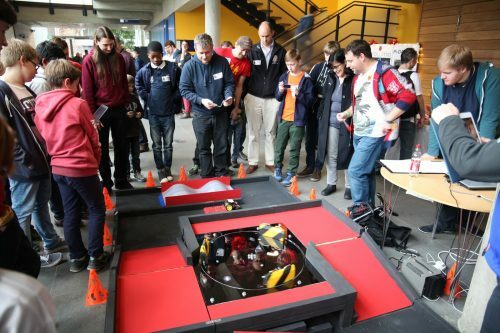 In addition to the competing teams, there will be plenty of show-and-tell tables featuring robotics projects, plus an extensive marketplace featuring your favourite vendors. The event takes place at the Cambridge Computer Laboratory (William Gates Building). There is free parking a (very) short walk away, and there is catering on site (or bring a packed lunch!). It’s a nice family-friendly day out. You can chat to the stall holders and teams (when they’re not running between challenges! ), and generally find out what is possible with the Raspberry Pi, some robotics components, a healthy dose of programming and a maker’s mindset! What have we been doing to prepare? Straight-line speed test (autonomous) – get down the course as fast as possible without touching the walls. The minimal maze (autonomous) – get around the maze without touching the walls. The line follower (autonomous) – follow the black line for as many circuits as possible. Slightly deranged golf (remote-controlled) – a beautiful, mystery course that will have a special component added to it by Pi Borg! The obstacle course (remote-controlled) – who knows what’s in store this year? Skittles (remote-controlled) – knock the pins down, score points. Pi Noon – the robot vs robot duel (remote-controlled) – pop the other robot’s balloon before the time runs out. Find out more about the courses and the rules on the Pi Wars 2017 website. Mike has been fiercely sending out emails to competitors, exhibitors, volunteers, vendors and our wonderful Pi Wars 2017 sponsors, without whom we would be unable to run the event. He’s also busy constructing individual timetables for each team, so everyone knows exactly where they need to be for their challenge runs. We’re really looking forward to the weekend – it’s all coming together, and with the help of our volunteers, you can be assured of a warm welcome to the venue. So, grab your tickets and prepare for an epic showdown between dozens of robots, all powered by your favourite single-board computer! There is an upcoming Pi Wars-style competition in Pennsylvania, USA on 3 June (The MagPi Magazine published a blog about this today), and we’re expecting another USA competition at some point, as well as a possible Pi Wars Scotland. As for the future of the Cambridge-based event? Let’s get this one out of the way first! Any questions? The best way to contact us is via the Pi Wars 2017 website. Alternatively, give us a shout on Twitter! Pi Wars in the USA? Great! Too bad I can’t make it this year but next year, I should be there! One week away and still got soooo much to get done. No robot building tonight tho, as I’m taking my PiWars 2017 entry ‘Pi Squared’ along to the Twickenham Coding Evening. After all robots like to get out of the house every now and then too. Can’t go there! Any chance for a video stream? Are there any Pi Wars in Australia? Pi Wars – Cambridge Jam. With robots. Pi Wars - adult and school teams are invited to enter!